Strategic planning is the process of developing and maintaining a strategic fit between the organisation’s goals and capabilities and its changing marketing opportunities. It relies on developing a clear company mission, supporting objectives, a sound business portfolio, and coordinated functional strategies. Business strategies are about effectively creating a point of difference for your organisation or business which in turn will increase market share, profits and customer loyalty. The strategic management of a business requires a different approach to management. This approach should involve creativity, lateral thinking, vision, planning and innovation. The ability to think and plan strategically comes easily to some people while others find it extremely difficult. Many businesses thrive by following what appear to be very simple strategies, while conversely other businesses with apparently complex strategies appear to struggle in many cases. And many businesses of course have no strategies at all - they open the doors and hope for the best, often with dire consequences. Ideally every organisation or business should set out their strategies in a document with input from a team of people and review their strategies on a regular basis - last years strategies may not be effective next year. 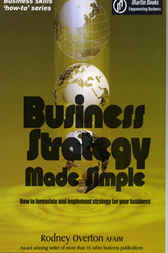 In this book we have endeavoured to provide a wide range of ideas to stimulate business strategies and to assist in thinking strategically. We have covered many facets of strategy, distribution, leadership, marketing, pricing, product development, and selling to name just some.